It’s obviously not enough to create an account on Instagram and start shooting photos to share. Successful content marketers on this social platform tailor their content to take advantage of the channel’s strengths, from hashtags and Stories to advertising and live video. Let’s explore how to use these features to maximize your content marketing strategy. You can use two types of hashtags in your Instagram campaigns – branded or community. Branded hashtags make your post easier to find for people who already know your company and are looking to find out more about it. 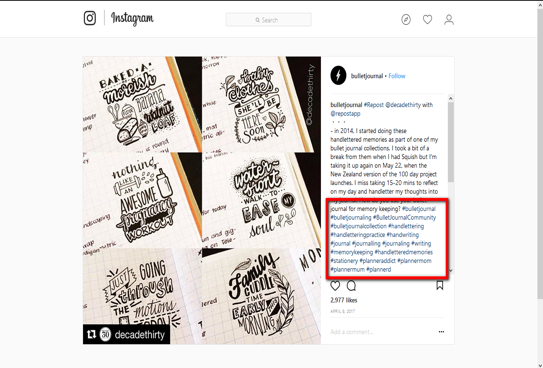 Branded hashtag examples from Bullet Journal, which has over 260,000 followers, include #bulletjournal #bulletjournaling, and #bulletjournalcollection. Community hashtags are commonly used or created by Instagram users to follow a topic, interest, or other unifying theme. In the Bullet Journal example, community hashtags include #writing, #stationery, #plannermom. TIP: Instagram limits users to 30 hashtags per post. 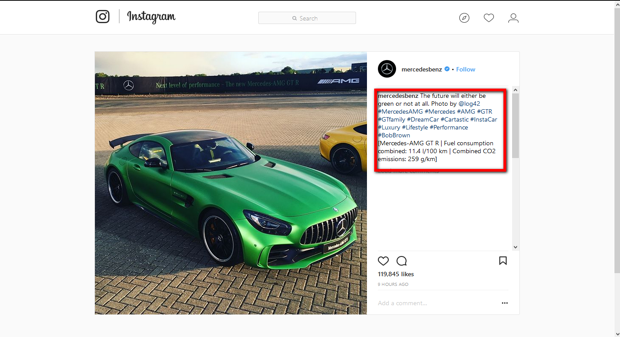 This Instagram post shows how Mercedes Benz uses hashtags. Observe the hashtags Mercedes uses besides the branded ones: #GTfamily, #DreamCar, #Cartastic, #InstaCar, #Luxury, #Lifestyle, #Performance. The community following those hashtags is interested in vehicles or products fitting in those categories. This is how prospects can find your brand and how they relate to your products in a quick and easy way. 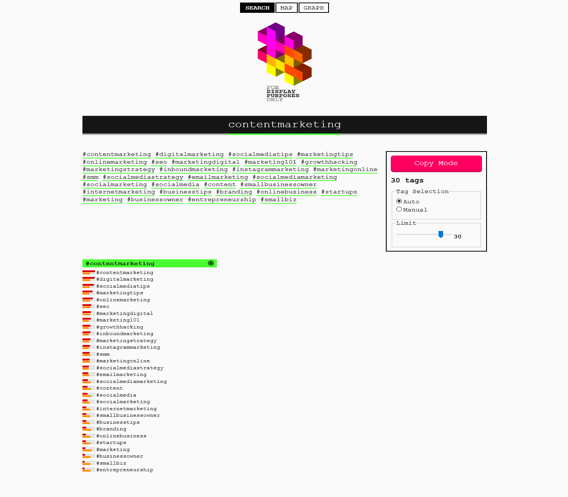 I like Display Purposes because I simply enter my topic and it generates a list of the most relevant existing hashtags. The Stories feature allows you to interact more directly and transparently with your audience, but these Stories are deleted after 24 hours from the top of the feed. Nobody expects you to invest significant time and money to create content for such a short time. However, last year Instagram added a way for Stories to last forever. It now automatically saves your Stories in your archives. You can choose to share them again through Instagram’s Stories Highlights feature. Instagram Stories help you grow your audience and keep it engaged with your brand because it allows you to keep your profile in their feeds not once but several times during each day. More Stories mean more chances to attract the audience’s attention. 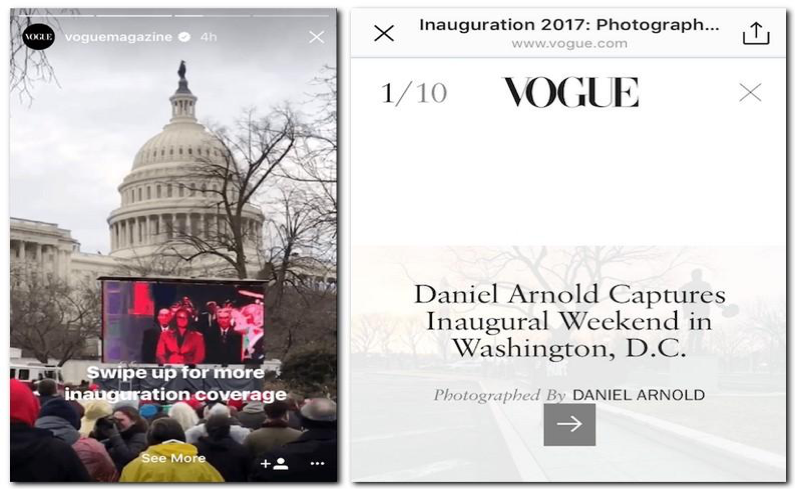 Vogue Magazine uses Stories, such as this one from the presidential inauguration last year, to drive traffic to its website. The approach is simple. Post a series of pictures and integrate a call to action inviting people to view more on Vogue’s website. TIP: The swipe-up feature is available to those who have at least 10,000 followers – another great reason to concentrate on building your community first. 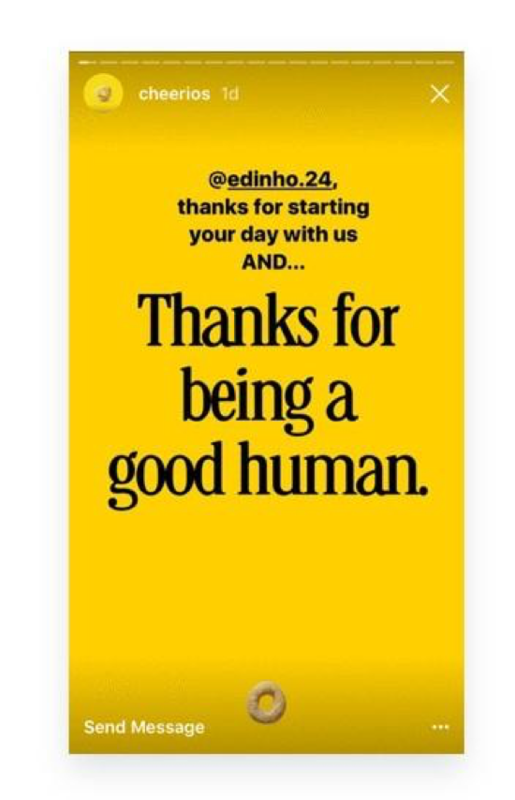 Cheerios uses Instagram Stories to keep people engaged with the brand through a series of personal messages. They are intended to make people feel good about themselves and the brand by triggering positive emotions. Eighty percent of people prefer to watch live video from a brand than to read a blog, and 82% prefer live video from a brand to social posts, according to research cited by Livestream. Instagram allows you to do live video, but you must take an extra step and share it to ensure that it shows up – and stands out – in Stories feeds. Live videos also can be featured in the Explore section, which expands your audience to possible new followers. A great example comes from Tim Coppens, creative director and founder of the fashion brand that carries his name. He is one of the first designers to use Instagram Live to stream his show of menswear at Pitti Uomo in Florence, giving his followers a chance to see the show without traveling to Italy. On a more personal level, you can do live video with a follower or group of followers, giving you the ability to deliver your content one on one or one to a few. 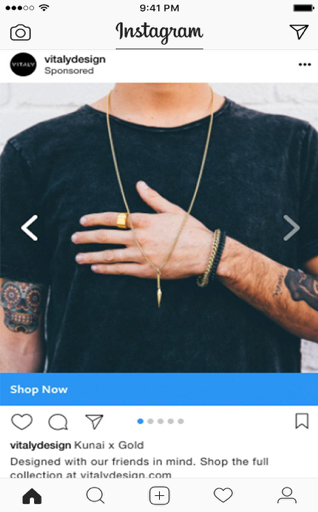 Instagram Ads are not intrusive because they look similar to other posts. And, unlike other social media platforms, they allow you to deliver full-screen ads. 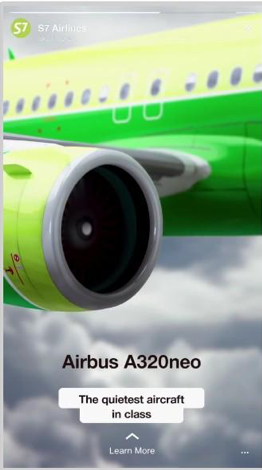 A great example of an Instagram advertising success is Russia’s S7 Airline campaign, which delivered ads on Instagram Stories through a series of videos showcasing new features of the planes. On the other hand, Vitaly earned success with more traditional ads on Instagram. As a lifestyle and fashion brand, Vitaly knows the power of visual imagery. To re-engage people who visited its website but didn’t make a purchase, Vitaly invested in dynamic ads on Instagram. Instagram Business reports the retargeting campaign reached more than 243,000 people and achieved a 3.9 multiple return on the ad spend. 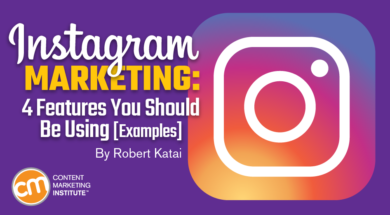 Instagram is a perfect channel for brands to deliver visual content customized for its followers and delivered in the best ways to attract their interest. Whether it’s a branded or community hashtag, a Story shared from your archives, live video, or inconspicuous ads, you can select the formats most relevant to your audience and your messaging. What are your experiences with Instagram? What tips do you have? Get expert insight into maximizing your social media content experiences at Content Marketing World Sept. 4-7 in Cleveland, Ohio. Register today for the best rates. Use code BLOG100 to save $100.